Bicycles entered the United States on the East Coast from Europe in 1869. By 1880, bicycling in the U.S. had become so popular that the League of American Wheelmen (LAW) was founded. One of LAW’s objectives was “to promote the general interests of cycling,” and “to facilitate touring.” Soon after the national organization was created, state and local divisions began forming. Bicycles entered Wisconsin as early as January 7, 1869 and grew in popularity until the Milwaukee Sentinel reported on June 29, 1890 “that no sport of the present century has grown so rapidly in popular favor as bicycling.” By this time there were more than 1,000 bicyclers in Milwaukee, many of whom cycled with the local division of LAW. Group of men and a young boy at a bicycling outing in Waucheta, Wisconsin. Image courtesy of the Wisconsin Historical Society. Image ID 111988. Logo of the Wisconsin State Division of the League of American Wheelmen. Image courtesy of the Wisconsin Historical Society. Image ID 99222. Perhaps the crowning achievement of the Wisconsin wheelmen’s efforts to improve their sport was the Wisconsin Tour and Handbook and its accompanying map collection. The tour book was a pocket-sized manual that wheelmen could take on trips with their set of maps to help navigate throughout Wisconsin. The 2nd edition, published in 1897, listed a total membership of 2,440 cyclists in 41 Wisconsin clubs, over 500 bicycle routes throughout the state, and over 100 League sponsored hotels and repair shops. These clubs, routes, hotels, and shops were spread throughout the state from Milwaukee and Madison all the way to Ashland and Marinette. The 1890’s bicycle craze was a world-wide phenomenon and Wisconsin was neither the first nor the most influential place to cycle. However, Wisconsin wheelmen glorified the state’s beauty and the freedom that bicycles offered. Cyclists worked hard in the 1890s to increase their club’s membership, improve Wisconsin’s roads, and promote bicycle touring throughout the region. 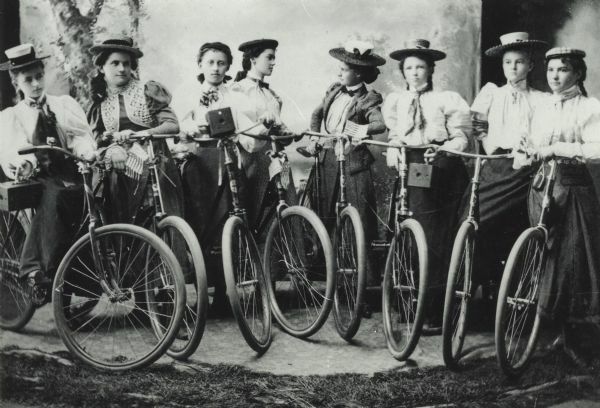 Featured image: a group of young women pose with their bicycles in Tomahawk, WI in 1900. Image courtesy of the Wisconsin Historical Society, image ID 98616. “League of American Wheelmen: Constitution and By-Laws,” (Boston League Headquarters, 1896), 3 and 5, Pamphlet Collection, Wisconsin Historical Society Library. “The Velocipede,” Milwaukee Daily Sentinel, January 7, 1869; “Fun on a Wheel: How Cycling Has Grown in Milwaukee,” Milwaukee Sentinel, June 29, 1890. “Chicago-Milwaukee Route,” The Pneumatic 7, no. 2 (May 1896); “Will Demand Guideboards,” The Pneumatic 8, no. 4 (July 1897); “Building Cycle Paths,” The Pneumatic 6, no. 12 (March 1896); “To Build a Cycle Path,” The Pneumatic 7, no. 2 (May 1896). “We are now in the lead,” The Pneumatic 6, no. 3 (June 1895). Sam J. Ryan, Wisconsin Tour and Handbook (Appleton, WI: Wisconsin Division, League of American Wheelmen, 1897), 7, Pamphlet Collection, Wisconsin Historical Society Library; Martin C. Rotier, Bicycle Road Maps of Wisconsin (Milwaukee: League of American Wheelmen, 1896), Map Collection, Wisconsin Historical Society Archives.